When we started Faith Community Church in 2004, one of the first ministries to develop was a youth ministry. Because several of the original families in the church had teenagers, this was a natural ministry to develop. The youth ministry has always been led by volunteers, mostly parents, who have a passion for teaching the Bible to the next generation and helping them become leaders in the church. Part of that ministry has been a week long effort each summer that we call Youth Explosion. It is a unique combination of games, food, fellowship, deep Bible study and leadership training. It is similar to spending a week at a high quality Christian summer camp, minus the overnight stay. 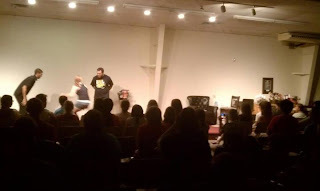 The first Youth Explosion had about 35 teens involved. This year’s Youth Explosion, which happened last week, had nearly 125 teens take part. Part of what makes the Youth Explosion event so effective is the leadership training aspect. The main Youth Explosion session last 3-4 hours and is in the evenings. But during the afternoons a hand-selected group of teens and college students gather for three hours of high level training and service projects. This has equipped them over the years to lead worship, serve as small group leaders, teach Sunday School, share their testimony, engage in service projects, as well as a variety of other ministries. This past week the leadership team worked hard to demonstrate the Gospel through live skits and video interviews. They also led a contemplative prayer service for 100 of their peers. There is something about watching a 17 year old lead a group of 14 years olds into a closer relationship with Jesus that is inspiring. As a result of last week’s Youth Explosion, there were 14 known salvation decisions and about 20 other decisions of various kinds. At least three of those young people will be baptized next Sunday. I am thankful for a group of adult leaders and a group of teenager leaders that can work together to share Jesus with the next generation. I pray that this type of ministry will be adopted by more churches so that young people across our nation can hear about Jesus from one of their peers. To learn more about how Faith Community Church is reaching the next generation, read the book, Mission Possible: Reaching the Next Generation through the Small Church. This easy to read 107 page book tells the exciting “behind the scenes” story of Faith Community Church and other churches in Vermont that are reaching young people. It is filled with practical ideas for how churches in other areas can do similar things in their own communities. A sermon developed by Dr. Terry W. Dorsett based on Philippians 3:18-20. Paul founded the church in Philippi on his second missionary journey after having a vision from God of a man asking him to come help them. (Acts 16:9). The population was a mix of both Romans and Greeks. The Jewish population was very small. Though there is some disagreement among scholars, most believe that Paul wrote Philippians from Rome while he was in prison. Verse 18 - For I have often told you, and now say again with tears, that many live as enemies of the cross of Christ. Paul wrote these words in a culture that was hostile to Gospel. In fact, Paul was in jail for preaching the Gospel even as he wrote these words. Across North America, and in many places in Europe, Western culture is no longer sympathetic to the Gospel. We frequently encounter people who are openly enemies of the cross. This should cause of great concern and we should spend time in intense prayer asking the Father to call the enemies of the cross to the foot of that very cross they despise. However, the most dangerous enemies of the Gospel are often those who may not appear to be openly hostile, yet inwardly fight against the truth of the Gospel in subtle ways. For example, I was recently in Haiti and noticed that there are signs and posters about God everywhere. Tap-taps (mass transit taxis) have Christian phrases written on them, as do many buildings. It would appear that Haiti is a very “Christian” nation. But many of the people of Haiti have simply added “Jesus” to the list of things they already believe. One Christian leader from Canada who has been working in Haiti for many years said, “Haiti is 90% Catholic, 10% Evangelic and 100% Voodoo.” He went on to explain how even people who appeared to be committed Christians would quickly turn to Voodoo when they had a serious problem. Though the Christian church teaches against Voodoo and the belief system that under girds Voodoo is in direct opposition to the Christian Gospel. What the Haitians have done is call syncretism. Syncretism is the combination of different systems of philosophical or religious belief or practice. Syncretism is one of the greatest enemies of the Cross because on the outside it looks like it accepts the Gospel when in fact it does not. People in Haiti are content to practice voodoo, pray to Mary and plaster “Jesus” on their tap-taps, but that is not the true Gospel. The true Gospel requires a 100% commitment to the Lord Jesus Christ and a total trust in His atonement on the cross for our eternal salvation. Any less than this is a false Gospel. While it is easy to see the syncretism in a place like Haiti, we have plenty of it in our own culture as well. Many Americans want to add Jesus to our belief system of consumerism, materialism and self-focus. Jesus becomes just one more thing on the list of what makes us “successful.” Jesus is not just one more ingredient for a successful life. Jesus is THE INGREDIENT for a successful life! When we are more loyal to anything other than the Jesus, we have become an enemy of the cross. Verse 19 - Their end is destruction; their god is their stomach; their glory is in their shame. They are focused on earthly things. Paul warned the Philippians that those who lived as enemies of the cross would meet a disastrous end. The Greek word for destruction is apoleia, which means utter and hopeless loss of all that gives worth to existence. However, it does not refer to extinction or annihilation or an end of existence, but to total ruin of one’s purpose of existence. How many people are living lives that have no purpose or direction? They move like emotional or spiritual zombies through life. That is the result of being an enemy of the cross. We only find purpose and fulfillment in life through a meaningful relationship with Jesus. Otherwise, just finding a little food for the day, a little bit of money, or entertainment, or some other trivial thing becomes our goal. A life pursing trivial things is mere survival not true living! When we are living as enemies of the cross, even our “best” days are still a shameful waste of our lives. When we live that way, our focus is on temporary things of this earth that will soon pass away. And we are often missing out on the things that have eternal or lasting value. Verse 20 - But our citizenship is in heaven, from which we also eagerly wait for a Savior, the Lord Jesus Christ. Christians should not be living lives that are meaningless. We are not supposed to be enemies of the cross. We are supposed to be allies of the cross, following the Christ of the cross on a meaningful journey through life that leads to a heavenly destination that will never fade. When we entered into a relationship with Christ, we were given a new spiritual passport; we are now citizens of heaven. On earth, some people have dual citizenship with two countries. Though that has some advantages on earth, it does create some divided loyalties. Too many Christians are trying to be “dual-citizens” of both earth and heaven. But a total commitment to Christ means a denunciation of our earthly citizenship. We must place all our hopes on the heavenly kingdom as we eagerly await the return of the King. Enemies of the cross include those who are openly hostile to Christ and those who have misplaced loyalties to anything other than Christ. Enemies of the cross will lack purpose, meaning and fulfillment in life. Allies of the cross have a 100% loyalty to Christ the King and stay focused on their heavenly journey with Jesus, encouraging others to join them on the journey. As I bring our report to a conclusion, I thought I would list some general observations I made while in Haiti. 1. The only "new" cars I saw in Haiti were UN hum bees, US Aid trucks, Red Cross Land Rovers, and vans with Christian relief agency logos on the side. Everything else looked like it had seen better days, many, many years ago! ‎2. Most of the young people had cell phones, even in rural Haiti where they did not have running water or flush toilets! They seemed quite adept at texting and many are on Facebook, I have already friended one person I met in Haiti. 3. There are Christian relief activities going on all over the island and apparently they are effective. Though we did see several tent cities with either UN tents or UNICEF tents, we did see any people who actually looked like they were starving. Clearly there are some poor people, but not the abject poverty we were expecting, and the credit for that goes to all those relief agencies. ‎4. American Christians have clearly made a statement about the love of Christ to the Haitian people. One Haitian said, "God has blessed America because they are a giving people. They give people, they give food, they give money, Americans are givers, not takers." One of the missionaries told me that a common Haitian saying since the earthquake is, "A terrible earthquake came, but then it started raining white people." And those people just keep giving and giving and giving. Baptists are particularly well represented. It was gratifying to know that all our prayers and financial contributions are actually making a difference. I am thank that the Lord allowed me to take part in this mission endeavor and pray that He will open doors for additional international mission service in the future. On Saturday we visited the Baptist Village in Fermathe. The organization was founded in 1943. For more than 60 years they have shared the Gospel of Jesus Christ by partnering with local Haitian leaders and generous people in the United States and Canada. They have seen tens of thousands come to Christ, educated three generations of families, and saved the lives of countless children and adults throughout Haiti. They are building a better future and bringing hope where there has only been despair. I appreciate ttheir emphasis on self-help, instead of creating dependence. They encourage people to use better farming techniques so they can feed themselves. They have a store that sells hand made crafts and food items so the local people can support themselves. 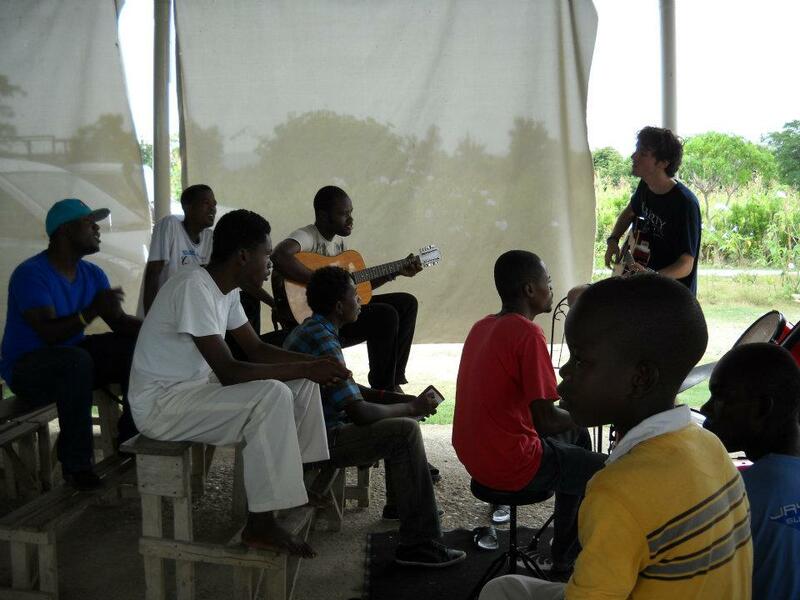 They also have a medical clinic and are involved in church planting across Haiti. Our visit there was inspiring. 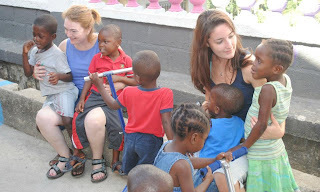 Later in the day we went back down to Petionville to the Toddler House at the orphanage. It was movie night and the children were to watch a children’s movie. But they were having trouble with the projector so they started playing some upbeat Christian music while they worked on the projector. The kids naturally started dancing and it quickly became a dance party. Picture 85 Haitian kids dancing to the music while a few white people from Vermont did their best to keep up. Who would have thought we would go to a kiddie dance party on a mission trip! Part of going on a mission trip is learning to be flexible. Things do not always work out as planned. Agendas get changed. Situations arise that might not have been prepared for. But effective mission teams learn to flow with the situation as it plays out and live in the moment. Our team did that and I was proud of them. Eventually someone got the movie going. It was projected onto a tarp on the wall of the orphanage. It was a Disney movie. In the middle of the movie the neighbors decided to have a REAL dance party and I could hardly hear the movie over the music from two houses away. That is also part of being on mission, realizing that others around us may not have the same value system as we do. So I prayed for the neighbors as I struggled to hear the movie. After the movie ended we drove THROUGH the neighbor’s party, since it had spilled out into the road. That was interesting. Then we went up the mountain to the compound where we were staying. I definitely did NOT like riding those roads at night. Imagine hitting a refrigerator sized pot hole in the dark! But there was not much traffic at that time of night, so at least we did not have to dodge traffic in the dark. We did see one accident that night, a motorcycle somehow managed to get under a car. But the rider walked away unharmed. It was the only accident we saw while we were there, which was a miracle in itself. When we join God in His mission efforts, we must learn to rest in the safety of His arms. He will let nothing happen to us that is not ultimately for our good and His glory. Last week we talked to author, Dr. Terry W. Dorsett about his book “Developing Leadership Teams in the Bivocational Church”. 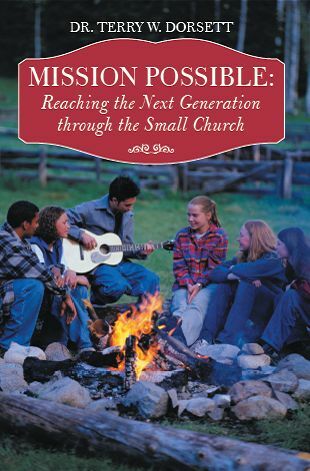 Today we focus on his other book, “Mission Possible: Reaching the Next Generation through the Small Church”. Welcome back, Terry! What is this book about? I was blessed to grow up in fairly large churches that were well funded. As a result of that, we always had a professionally trained staff member who oversaw youth programs. That kept my siblings and I interested in church and is probably one reason all four of us have worked for churches, or other faith based organizations, at various points in our careers. When I moved to Vermont it quickly became apparent that the churches were too small to have staff members running those kinds of programs. Sadly, many young people left the church as a result. My wife and I, along with a small core of other parents, decided to do something about it. We built a strong youth ministry in Central Vermont based on volunteers. We currently have 180 young people enrolled in it, with no paid staff members. This book basically shares how small churches with limited budgets can have effective ministries to people under 30. It is based on our own experiences, and on extensive research about what is working in other places. Again share a little bit about where you live and how that impacts your writing. I live in the small state of Vermont. From a pure beauty standpoint, it is a wonderful place to live. The mountains and valleys and lakes and streams and small towns and village greens are just a fabulous setting for life in general. It is a great place to raise a family. However, from a spiritual perspective, it can be a challenge to be an evangelical Christian in Vermont. Vermont is the least religious state in the United States and has the highest proportion of people who claim “none” on various surveys about religion. This impacts my writing because though am a conservative Christian, almost all of the young people that I work with in youth ministry have a different world view. Many are agnostics. Few easily accept Christian ideas and concepts at face value. When I began to write this book, I wanted to show people who share my world view how they could build bridges to communicate with those who have other world views. It was very challenging, but I think this book does it well. What was the motivation behind the book? I often serve as a guest speaker in small churches. I became burdened for how “old” the congregations looked in most small churches. I knew from my own experience that small churches could reach young people. But since people always tell me that our church is “special” I wondered if any small church could do it. Occasionally I would find a small church with a lot of young people, so I began to ask a lot of questions. I found certain common elements in small churches that had young people and those that did not. I took those ideas, matched with my own experience, and mixed in a lot of research of what was happening in other places across North America, and the book emerged. Many small churches have become so discouraged about the lack of young people that they have given up trying. My number one hope is that my book will reverse that trend. I want small churches to know they CAN reach young people and they can do it well. This book is written for any person who is a member of a small church with less than 200 attendees on Sunday morning, which includes most churches across North America. If you care about your children or grandchildren, and they are not in church, read this book. You can help your church do this! Is there anything else you want your readers to know about you that would give us a glimpse into your personality and passions? Though I appreciate people of all ages, I think the greatest hope for revival in North America lies in the next generation. Because so many of them are post-Christian, when they discover faith in Christ, it is fresh and new to them. That infuses them with an energy that is infectious and greatly needed in most churches. My wife and I have dedicated much of our energy the last two decades in reaching the next generation and we long to see a great revival sweep that generation. Friday was perhaps our most intense day in Haiti. We left the compound at Fort Jacque at 6:30 AM and drove down the mountain to Petionville where we picked up the ladies. 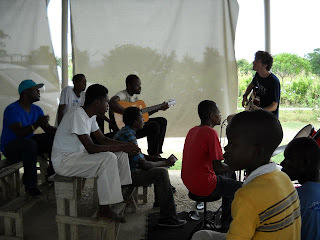 We then drove three hours on horrendous roads to Merebailas, a small rural village where there is a small orphanage, church and a school run by a Haitian pastor. Our route took us right through several Friday morning markets, where people were selling stuff in the streets. The roads were so narrow and so many people were in the streets that when we drove through they had to pick up some of the fruits and vegetables they were selling so we would not run over them. The crowd was so thick in the streets that only the grace of God kept someone from being run over. Several times we were less than an inch away from another truck, car, motorcycle or person. But each time our drive (an Australian named Dave) managed to find our "space" on the crowded road. For the entire three hour drive most of us were standing up in the back of the truck because the floor was filled with supplies for the orphanage. ‎We drove over a mountain, through a dusty limestone quarry, and down the mountain on the other side. Apparently they have not heard of guard rails in Haiti. But the Lord was with us. Along the way we stopped at a roadside stand and ate "road food." Fried pig, fried bananas, pickelese (it looks like cole slaw without the mayonnaise and it is incredibly spicy!) and American Coca Cola. Though a few of us were nervous about eating road food, none of us had any negative reactions. At the roadside food stand we also took a bathroom break, except there was no actual bathroom. The group took turns doing what needed to be done behind a broken down semi beside the road. Let’s just say that it was an interesting experience that we hope to not have to repeat any time soon. ‎We were glad when we finally arrived at the church/school/orphanage. The church was just a roof and floor, there were no walls. They had some benches, but we delivered the parts for more and assembled them on site. We taught some of the Haitian boys in the orphanage how to use power tools and ratchet wrenches. Considering that the young men on our team were also rather inexperienced at using those items themselves, and we could only speak a few words to each other because of the language barrier, it was an interesting teaching moment. We also painted the pastor's office (a small room with windows that did not have glass) and his home (which also houses the orphanage of 25 kids). I taught two 12 year olds who spoke no English how to use a paint brush. Though they left a couple of bad spots, I was proud of their work at the end of the day. ‎Perhaps one of the most moving experiences of the day was totally unplanned. Some older teen boys in their church were playing some praise music. One of the guitars was very out of tune. One of the young men on our team, Alexander, has been gifted by God with perfect pitch. He offered to the tune the guitar. He also gave the drummer a short lesson. And suddenly, a worship moment just happened. They started playing praise music and signing together, some in English (they knew a lot of the same songs we sing at our church) and some in Creole. The worship time just kept going on and on. It was so moving to watch Alex, who has a quiet gentle spirit, take those young men on a journey to the throne of heaven and back. I do not know about other people on the team, but I cried, and then cried some more. I have been told that there are not supposed to be tears on heaven, if there are, half the angels were crying too! ‎The ladies at the church prepared an authentic Haitian lunch for us. Fried chicken (no bread coating, just chicken fried in oil), pasta salad (pretty much like ours, but spicy), beat salad (absolutely out of this world!!!! ), and pickelese. It was touching to see how people who had so little treated us so kindly. On the way back over the mountain I thought we were going to have an accident several times. There was this insane fascination with driving extremely fast and the truck with the loudest horn apparently had the right of way. Stop signs were clearly just suggestions, and pretty much no one took the suggestion! I do not know how Haitians keep from having fatal accidents daily. But three hours later, we returned to the main house in Petionville safe and sound. We dropped the ladies off and then the men went up the mountain to Fort Jacque. We were tired, gritty, and sweaty, but felt very fulfilled knowing we had touched the "least of these" in Jesus' name. If you missed the first two parts of this report, click here for part one and click here for part two. We spent most of the day burning large piles of rubbish. Haitians tend to throw all their trash on the ground since no one has taught them otherwise. We had collected up a lot of trash from around the compound and added it to the pile of scrap lumber and other construction debris. 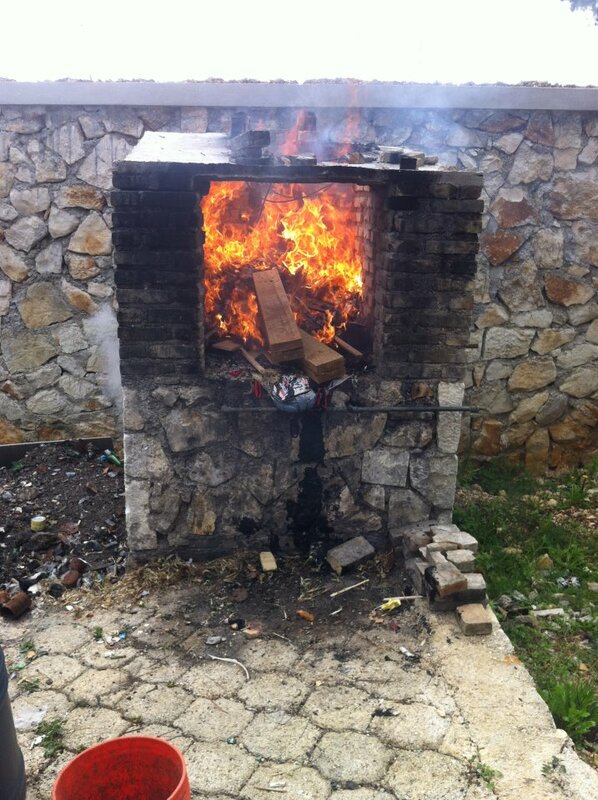 Since there are no town dumps to dispose of these items properly, and no one in Haiti has ever heard of recycling, the orphanage has no choice but to burn the trash, including plastic bottles and broken plastic tables and other similar items. Most of the stuff we burned would NEVER have been burned in America. The black smoke rolled upward most of the day and we were sure we created a hole in the ozone layer above the compound. But when we were finished, the entire area was clear of all the debris and everything was sorted and ready for the next round of construction, which begins August 1. Some of the mission team painted the trim on three of the new toddler houses that will eventually house orphans. Some of the team assembled two basketball goals that will get put up when the playground is complete. Some of the team rejuvenated a lovely garden that had gotten severely overgrown with weeds. When they got finished, it did not even look like the same space. In a facility like this, there is a never ending list of things to do and we were glad to serve the Lord be checking several items off that list. In the evening, the mission team enjoyed a hotdog cookout for dinner and once again we thought about how well we were eating and how poorly those around us normally eat. This experience has made several us very “food” conscious as we watch our seemingly ever expanding waistlines. If there is one thing we have learned on this trip, it is that most Americans are very spoiled and do not even know it. Perhaps that is one of the lessons God wanted us to learn on this trip. red the "best" preemie care in the nation. We will spend the afternoon at the "toddler" house. The girls are looking forward to a day with the kids. The boys.....not so much..... they are afraid of diapers....well...actually they are more afraid of what is IN those diapers. But I think there is some painting they can dDay Three in Haiti started with the sound of children playing at the school next door. The entire school experience in Haiti is different than in the United States. Students have to buy uniforms and pay various fees. Those who cannot afford it are unable to attend. Forty percent of children across Haiti will never attend school at all. Others will attend for a few years. Few will make it all the waythrough school due to the financial challenges. Several people told us that the greatest thing we could do to help Haitians was to sponsor a child to help them attend school. Just as education in America is important to getting a good job, so is education in Haiti. After a terrifying ride in the truck down the mountain, we played with 85 kids in the morning at the "Toddler House." At this particular orphanage, toddlers are age 3-12. It was amazing how many kids they had squeezed into such a tiny area, but somehow, they all fit as they played games and enjoyed being outside. They normally only have 60 children at a time in the home due to space issues. But recently another orphanage was shut down by the government due to appalling conditions (rats were in the cribs biting the children and one child died from this) and all the children from that other orphanage were sent to GLA. Though GLA did not really have the room for all those children from the other orphanage, they took them all in anyway, that’s what love does. Love finds a way regardless of space, money, comfort, convenience. The staff at GLA overflowed with a deep and abiding commitment to love children no matter their circumstances or situations. Americans could learn a lot from the example GLA set. After a Haitian lunch of beans and rice (which would be our daily lunch menu for the rest of the week), we helped care for 40 infants over at the Main House. GLA actually started as a baby orphanage and after it kept growing they added the Toddler House for the older children. GLA is one of the few orphanages in Haiti that will accept babies that are born pre-mature. Such babies often have a wide variety of health issues and require an extra-ordinary level of care. They showed us the "preemie" room. It was about the size of a small bedroom. It had 6-8 cribs in it and two incubators with babies in it. Most of the equipment looked ancient. It is unlikely that any hospital in America would have been that crowded or under-equipped. However, that particular preemie unit is considered the most advanced in the nation of Haiti. Each volunteer is assigned a certain number of babies for the week and part of their job is to spend one hour of personal time with that child each day. Because we had a large number of ladies on our team, there was only one little guy for me to play with. That little fellow and I had a lot of fun in the swing and playing with toys. And yes, I even changed a diaper, my first diaper change in 15 years, and I still remember how to do it. Let’s just say that it looked like honey Dijon mustard, but smelled MUCH WORSE!!!! I hope that little fellow remembers that he is greatly loved by the Father and that the Father sent a few earthly fathers to demonstrate that love until he can be placed in a permanent home. After an intense day with the children, it was time to get back in the truck for another terrifying trip up the mountain. I do not understand why all the drivers in Haiti are in such a hurry when they get behind a wheel. Maybe they think they are race car drivers? When you consider that the “road” consists of a string of potholes perched on to the side of a cliff, the wild speeds and excessive horn blowing makes for quite the trip! Back at the compound where the guys were staying, we had a relaxing evening around a campfire. Our security guard, Sergio, entertained us with great stories. We laughed so hard our stomachs hurt as he told us stories about his interesting diet. He said he likes to eat goat, chicken and cat. But he does not like cow. He said beef was too fatty. Interestingly enough, he said he could never eat a dog; they are too "nice." After listening to his stories, we decided we were glad he was not our cook! To our American mindset, it may sound terrible to eat some of the things people in Haiti eat, but when you are hungry, you do what you have to do to survive. Perhaps it is time for Americans to realize just how good we have it and stop complaining so much. Many months ago 18 people from Faith Community Church, including teens, college students and middle aged adults, felt led of the Lord to become involved in a week long mission effort in Haiti. As the months went by, some people were added to the group, others had to drop out, but in the end 15 people flew to Haiti, to assist God’s Littlest Angels in serving orphans. Our group flew out of Boston at 3 AM on Monday morning with 30, yes, thirty, bags. 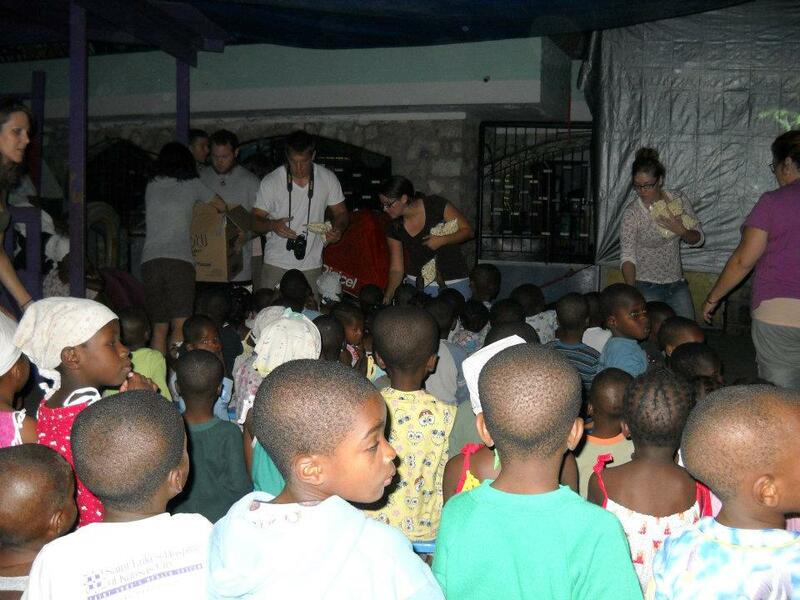 Each person had one personal bag of their own stuff and one bag filled with items requested by the orphanage. 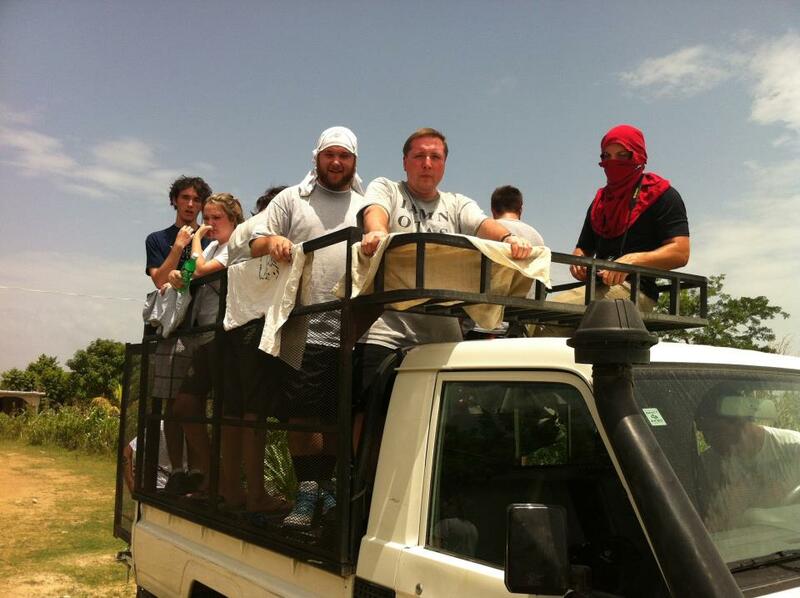 We arrived safely in Haiti but four of our 30 bags did not make it. We would not see those bags again until the day we left, which is when they finally arrived. After a frightening, but as we were to quickly learn, quite normal, ride through the chaotic streets of Port au Prince, we made it to the orphanage, which is 45 minutes away in Petionville. They sent a van and a pickup truck to the airport to pick us up. Five of us rode in the back of the pickup with the luggage. Think of all your worst urban traffic nightmares rolled into one, then double it and close your eyes and scream and you will have the same experience we did driving from sea level to 4500 feet up a mountain through traffic that had no discernible rules others than the vehicle with the loudest horn had the right of way. We got to hold some of the orphans for a while that evening. Then the ladies remained in Petionville, where the orphanage is. The guys had to travel another 25 minutes farther up the mountain to the town of Fort Jacque, where the new orphanage is being built. 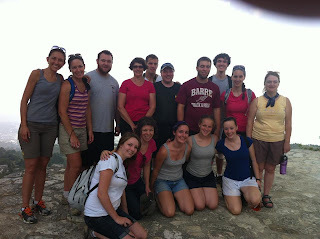 Though Port au Prince was hot, we were happy to learn that when we got that high up on the mountain there was a nice breeze blowing and it was not too hot. 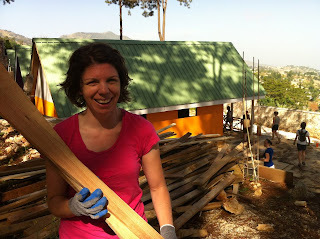 On Tuesday we cleaned up the construction site where they are building six "toddler" houses. That particular orphanage considers children age 3-12 “toddlers.” Our work including hauling a bunch of lumber around and sorting it into correct piles, leveling out one pad for a foundation and digging a trench for a waterline. Digging the trench involved splitting a giant rock with a pick ax. And that was ALL BEFORE LUNCH!!!! The mission team worked very hard and I was quite proud of them for their servants' hearts. We had beans and rice for lunch, which would be a daily occurrence. It was good, just a little spicy, but not too much for our American pallets. After a brief rest, we walked through the village, which was a cool experience, and then toured an old Haitian fort on the edge of the village. In the afternoon we continued to sort the massive pile of lumber into what was still usable, and what needed to be burned. We also cleaned up all the rest of the property of various pieces of debris. There was quite a bit since they had built several buildings in the last few months and no one had cleaned the site up in some time. Some of the team did some weeding. Some of the team helped organize the supply barn. Some of the team cleaned and organized the generator area and equipment. We had nachos for supper (yeah, in Haiti, isn't that funny!!!!). During supper we heard what sounded like a marching band playing out in the street. The missionary had us go look at the street and it was a funeral going by, complete with a brass band. The people were all dressed up in black and white. After supper we fellowshipped with the team and with the local missionaries before the ladies headed back down the mountain to where they were staying. 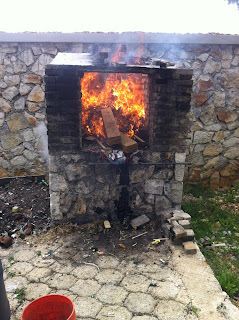 The young men and I then started cutting up and burning the lumber that was not salvageable. We also were asked to burn a large assortment of other items that were broken or otherwise unusable. It was quite an assortment of stuff and let's just say they do not have any rules about what you can and cannot burn in Haiti. I am sure there is a growing hole in the ozone layer over the compound. By the end of the day our bodies were very tired, but our spirits were happy to have served the Lord. I will share more of our journey in tomorrow’s post. It is with pleasure that I interviewed, Dr. Terry W. Dorsett on my blog Word Salt. Tell my readers a little bit about your book “Developing Leadership Teams in the Bivocational Church”. Many small churches are unable to fully fund a pastor’s salary; therefore the pastor has to work a second job (vocation) in order to meet his or her financial needs. Working a second job puts a lot of pressure on a pastor because it takes away from the amount of time that can be devoted to visiting and counseling members of the congregation, it reduces the number of hours a pastor has to prepare for worship services, and it significantly impacts how available a pastor is in emergency situations. My book helps pastors who work additional jobs learn how to train members of the church to do some of pastoral ministry instead of the pastor having to do it all. This allows all the spiritual needs of the congregation to be met, without increasing the church budget. Though many people think of this as a “new” idea, it is really an ancient idea that is coming back into vogue again as the cost of having a fully funded clergy has increased in recent decades. Tells us a bit about where you live and how that impacts your writing. I live in the small state of Vermont. From a pure beauty standpoint, it is a wonderful place to live. The mountains and valleys and lakes and streams and small towns and village greens are just a fabulous setting for life in general. It is a great place to raise a family. However, from a spiritual perspective, it can be a challenge to be an evangelical Christian in Vermont. Vermont is the least religious state in the United States and has the highest proportion of people who claim “none” on various surveys about religion. This impacts my writing because though I am a conservative Christian, many of my readers are much less conservative. I have to stay true to my own beliefs, yet write things that my friends and neighbors are interested in reading. Have you been able to get your ideas outside of your sphere of influence, and if so, how did you do it? This was my first book, and being an unknown author, did make it a challenge to get the ideas from my book into the main stream. Add to that that I live in small state that is relatively non-religious and my since book is about church leadership, at first many people did not take it seriously. But three things helped me get outside my small world. I wrote a lot of “guest posts” on blogs, and let the owners of those blogs write “guest posts” on my blog. That expanded my exposure a lot. 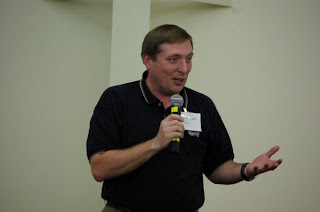 I also volunteered to speak at a number of conferences that covered material similar to my book. At first, I did not get paid for those speaking engagements or sell many books at them. But I’m a fairly effective verbal communicator, so as word got out, organizations began to invite me to come speak and I would have them buy a book for everyone who attended, which put the book into the hands of key people that could in turn talk about it with others. Lastly, I was able to do several radio interviews. Most were local shows with limited audiences, but two were on internet radio, and one was a nationally distributed program. Those both helped grow my name recognition in my niche market. Now, I have sold nearly four times the number of books outside my little state than I have inside, and I continue to get invitations to speak in larger venues, which I hope will continue to help me get this message out to those who need to hear it. I serve as bivocational pastor, with my second job being an administrator for a faith based non-profit that helps small churches in Vermont create partnerships with other organizations so they can accomplish their ministries more effectively. Most of the pastors I serve through that organization are bivocational. It seemed that many of them were perpetually on the edge of burn out. I felt a burden to do something about it. At first I was running around the state trying to meet with them all to give them tips on how to use lay people to carry some of the burden. While I still do a lot of those types of consultations, I realized that I would never be able to spend enough time with individual pastors to change the culture of small church life in Vermont. So instead, I wrote a book that allows me to “be” in multiple places at one time, not only in Vermont, but across North America. First, I think this book gives pastors and church boards hope. Though these are challenging days for small churches, they can have effective leaders and they can make a difference in their communities. Second, I think this book gives pastors and church boards some practical tools that can be used to train people how to help their church be healthier. Just offering hope is good, but practical ways to bring that hope into reality is better. I think this book does that. Though many people think a book about church leadership is primarily for pastors, I really wrote it with both pastors and key church leaders in mind. Deacons, elders and other leaders have to be on board to make any lasting change in ministry structure or style. Therefore, I wrote this book in the hopes that half a dozen key leaders in each church would read it and grasp the ideas about how lay people can carry some of the ministry load and want to implement them. God really has a sense of humor! I grew up in relatively large churches in a city in the mid-west. I also served on staff at a mega-church in Virginia for several years. Then God called me to serve as both a pastor in a rural state and an administrator for a faith-based non-profit that serves small churches. In some ways I am way outside my comfort zone. But what I have learned is that people are people anywhere you go. If you learn to listen to them, and adjust your methods and styles to fit the context, a leader can be a leader anywhere God places him or her. One of the reasons many churches are loosing youth and young adults is the misunderstanding of the “decision makers” to adapt technology into the life of the church. The announcement below was lifted out of an actual order of service in an urban church that I recently attended. Even the phrase “electronic devices” refers more to vacuum tubes and integrated circuits, and clearly reflects an outdated understanding of today’s digital data technology. Used properly in worship digital devices can excite the congregation, be a great outreach tool, and help a church grow. I use my Blackberry in worship! In fact, my Bible is on my phone. Why would church leaders ever suggest that reading one’s Bible in service is being discourteous to others? Digital Bibles are increasingly used by the masses today because it is free and printed Bibles are expensive. Fewer and fewer people own printed Bibles. A few weeks ago in another church, I watched as a man used his iPad during service. I watched as he followed along with the Scripture readings, and then took notes as the pastor preached a dynamic sermon. This was no more distracting to me than if he used a printed Bible and a pencil and paper to take his notes. What pastor would not desire for his listeners to take sermon notes? Some people even use their phones to make digital recordings of the messages so they can listen to it again, or share it with a family member who is unable to attend. This bulletin announcement clearly shows leadership that is out of touch with the people to whom they are to minister, and it is a clear turnoff to youth and young adults. Failure to use technology in the church is certain to lead to participatory decline and eventually the death of the church. Sometimes I use my phone to snap a picture (no flash) and send in out to social media outlets with a note like “this music is fantastic” or “the pastor is firing on all cylinders today” followed with something like “ I sure wish you were here to enjoy this service.” Smart effective pastors encourage this in their churches. It builds excitement, boosts attendances, and is one of the best methods of modern outreach. Why do church leaders want to stifle outreach and growth? Can you imagine the number of people that could be reached if just ten percent of the people in attendance at your service did this every Sunday? If your church is not using digital data technology in its worship and Bible study, I challenge you to sit down with a group of 15 – 25 year olds and ask this question, “How can we use digital data technology in our services? Let them brainstorm, share openly, and observe their excitement. Then ask them this question, “Will you help our church do some of these things you just suggested? Again, observe their excitement! Don’t you really want to find a way to use these wonderful ideas and excitement to grow your ministry? A sermon developed by Dr. Terry W. Dorsett based on Jonahs 3:1-2, 5, 10, 4:1-11. God asked Jonah to go preach to the evil people who lived in the city of Nineveh. Jonah got on a ship and sailed the other way instead in an effort to run from God. God sent a huge storm that kept Jonah from running away. Instead, Jonah got thrown overboard and swallowed by a big fish. After three days in the fish he was vomited onto dry land near Nineveh, ready to obey the Lord. Jonah 3:1 - Then the word of the Lord came to Jonah a second time. • Even though Jonah had ignored God the first time, God gave him another chance. • No matter what we have done, and how far astray we have gone, God is willing to give us another chance. Verse 2 - Get up! Go to the great city of Nineveh and preach the message that I tell you. • God gave Jonah the very same job that Jonah had previously failed at. • The reason God asked us to do something in the first place was to either teach us a lesson or to help us help someone else. • Therefore, our second chance often involves something similar to our first chance. Verse 5 - The men of Nineveh believed in God. They proclaimed a fast and dressed in sackcloth—from the greatest of them to the least. • The evil people turned from their bad ways and placed their faith in God. • They fasted, which demonstrated their willingness to sacrifice for God. • They dressed in sackcloth, which was a symbol of humility in their culture. • When we really place our faith in Christ, there should be external evidence based on the inner change we have experienced. • If there has been no external change, then there was probably no inner change. Verse 10 - Then God saw their actions—that they had turned from their evil ways —so God relented from the disaster He had threatened to do to them. And He did not do it. • God saw their actions and had mercy on them. • Mercy is not getting the punishment we deserve. • We have all received mercy, for which we should rejoice! Chapter 4, Verse 1 - But Jonah was greatly displeased and became furious. God had done a mighty work and how did his prophet respond? • Jonah was “displeased.” The Hebrew word could mean sad but it can also be used to mean evil. This was a sadness that was evil in its intent. • Jonah was “furious.” The Hebrew literally means “he was burned up” in his negative emotions that came from his evil intent. • Jonah did not like the people of Nineveh. • Jonah wanted the Ninevites to be judged by God. • Jonah thought they were the “wrong” kind of people to share his faith with. • Anytime we divide people into groups and then say a certain group is not welcome, we have misunderstood the mercy of God. Verse 2 - He prayed to the LORD: . . . I knew that You are a merciful and compassionate God, slow to become angry, rich in faithful love, and One who relents from sending disaster. • Merciful – not giving the punishment that people deserve. • Compassionate – moved to take action to help those in need. • Slow to become angry – it takes a lot to get God mad at us! • Rich in faithful love – God has so much love to give out that He never runs out. • Trying to not send disaster – God does everything possible to keep from punishing people. He will do it if He has to, but He tries everything else first! • Jonah liked all of these attributes about God when they were applied to his life. • But Jonah got upset when God showed the same kindness to those that Jonah did not like. • Many of us are more like Jonah than we want to admit. • We want the grace and mercy of God for ourselves, while wanting the wrath and judgment of God for others. Verse 4 - The LORD asked, "Is it right for you to be angry?" • God challenged Jonah’s motives and logic in order to get Jonah to see the situation the way God saw it. • God sometimes has to do something to get our attention and help us see things from His perspective. Verse 5 - Jonah left the city and . . . made himself a shelter . . . to see what would happen to the city. • Jonah did not answer God’s challenge. • He was still stubborn. • So God was going to have to use some other way to get his attention. • Does that scenario sound familiar? • Many of us have had to “repeat” certain lessons from God because we missed it the first time around. Verse 6 - Then the LORD God appointed a plant, and it grew up to provide shade over Jonah's head to ease his discomfort. Jonah was greatly pleased with the plant. • “appointed” – Hebrew word “manah” which means prepared. • God supernaturally aided Jonah even when Jonah was clearly in rebellion to God. • How often has God helped us even when we did not deserve it? • Jonah liked it when God helped him. • Probably in his anger he thought he deserved the help, though clearly he did not. • Too often we start demanding things of God as if He owed us His assistance. • God has already given us more than we deserve and He owes us nothing else. Verse 7 - When dawn came the next day, God appointed a worm that attacked the plant, and it withered. • Just as God prepared the plant, God also prepared a worm to destroy the plant. • God gives and God takes away. • We like it when God gives. • We do not like it when God takes away. • But if God knows what we need, then we should trust Him regardless of whether we are in the receiving or losing mode. Verse 9 - Then God asked Jonah, "Is it right for you to be angry about the plant?" "Yes," he replied. "It is right. I'm angry enough to die!" • God asked Jonah the same question as before. • This time Jonah gives an answer. • It is a self-righteous and conceited answer. • It was also the WRONG answer. • Jonah had not planted the plant. • Jonah had not watered the plant. • Jonah had not tended the plant. • Jonah had only enjoyed the fruit of God’s work and had no fruit of his own to enjoy. • We often like all the blessings that God gives us and tend to think that we earned those blessings when in reality they were gifts from God. Verse 10 - So the LORD said, "You cared about the plant, which you did not labor over and did not grow. It appeared in a night and perished in a night. • God points out that Jonah cared about things that he had nothing to do with. • God also points out that the things Jonah cared about were temporary and really did not matter that much. • What do we care about? Verse 11 - Should I not care about the great city of Nineveh, which has more than 120,000 people . . .
• God cares about people! • While Jonah was complaining about his comfort level, God was caring about people. • While Jonah was upset because people did not get the punishment he wanted them to, God was busy changing those people’s lives and drawing them to Himself. • After all Jonah had experienced, he still did not seem to get the point of God’s mercy and grace. • As a pastor, I have met many people who just never got it. • It seems like there should be another chapter where Jonah realizes that God loves ALL people and wants them to experience mercy and grace. • But no such fifth chapter exists. • Many theologians have wondered why there is no fifth chapter in Jonah that tells us what happened next. • Did Jonah get right with God and live happily ever after? • Did he end up inside another fish on the way home because he still had not learned his lesson? • We do not know what happened to Jonah. • But our focus should not be on how God deals with others. It should be on how God deals with us. • So what will OUR fifth chapter be? • Will we turn our focus from self and toward the people around us whom God is calling us to reach for Him?